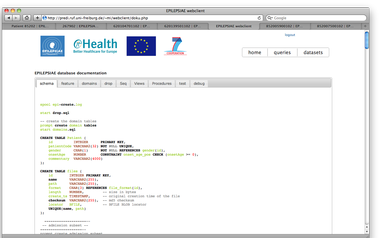 In the frame of the EPILEPSIAE project we have successfully developed a database for epilepsy data. 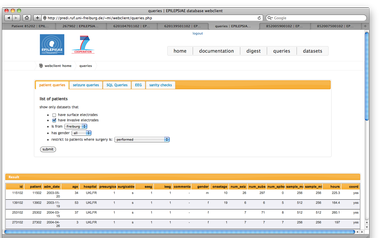 The database contains well-documented meta data, highly annotated raw data as well as several calculated features. Please refer also to the Annotation Protocol. In total the database will contain continuous long term recordings of 275 patients, i.e. 225 scalp recordings and 50 intracranial recordings. The data acquisition and database are approved by the local ethics committees. Once the EPILEPSIAE project has finished the database will be made available to the research community. The database is fully implemented. 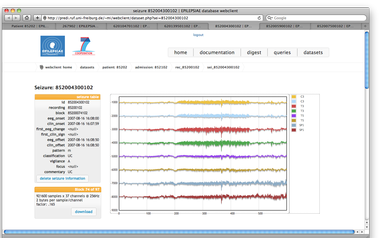 The database currently holds more than 100 annotated datasets. EPILEPSIAE holds the WORLD's LARGEST EPIELEPSY DATABASE FOR SEIZURE PREDICTION! Although the Freiburg Epilepsy Center has pioneered the offering of high-quality long-term EEG data for scientific research groups , currently, such data resources, crucial for the development and evaluation of seizure prediction algorithms, are sparse. Funded by the European Union, the EPILEPSIAE project (Evolving Platform for Improving Living Expectation of Patients Suffering from IctAl Events, Grant 211713), a 7th FWP with seven clinical, academical and industrial partners in Coimbra, Freiburg, Paris and Treviso was established to boost seizure prediction research in several ways: in addition to the development and further advancement of prediction algorithms in the expertise areas of the participating centers and the development of a small transportable alarming device by our industrial partner, the first extensive, shared, european epilepsy database containing high quality neurophysiological recordings of more than 300 patients from all clinical partners will be set up during the lifespan of the project. Besides the raw EEG recording data, comprising at least 5 days of continuous recording for each patient with at least 24 channels and sampling rates of up to 1024 Hz, this database contains an even higher amount of derived EEG features, skull stripped magnetic resonance imaging (MRI) data and metadata information about recordings and patients. Although the Freiburg Epilepsy Center has pioneered the offering of high-quality long-term EEG data for scientific research groups , currently, such data resources, crucial for the development and evaluation of seizure prediction algorithms, are sparse. Funded by the European Union, the EPILEPSIAE project (Evolving Platform for Improving Living Expectation of Patients Suffering from IctAl Events, Grant 211713), a 7th FWP with seven clinical, academical and industrial partners in Coimbra, Freiburg, Paris and Treviso was established to boost seizure prediction research in several ways: in addition to the development and further advancement of prediction algorithms in the expertise areas of the participating centers and the development of a small transportable alarming device by our industrial partner, the first extensive, shared, european epilepsy database containing high quality neurophysiological recordings of more than 300 patients from all clinical partners will be set up during the lifespan of the project. Besides the raw EEG recording data, comprising at least 5 days of continuous recording for each patient with at least 24 channels and sampling rates of up to 1024 Hz, this database contains an even higher amount of derived EEG features, skull stripped magnetic resonance imaging (MRI) data and metadata information about recordings and patients. Besides the database organizing and holding the input and output data of the prediction algorithms, a huge amount of computing power is needed to perform the actual calculations. In order ot gain affordable computing power, several approaches have been taken into account, i.e. client/server based applications utilizing the computing power of idling standard PCs . The participation in the Black Forest Grid gives our project access to the necessary computational resources needed for our extensive calculations and delivers a suitable infrastructure for the development, testing, performing and evaluation of our prediction algorithms, e.g. based on the bivariate mean phase coherence or the univariate dynamical similarity index. The massive parallelisation that we gain from utilizing the grid reduces our calculation times enormously. Previously, a duration of several weeks was not uncommon. Thereby, the quality of our algorithms benefits from shorter calculation times that allow more refinement cycles in the develpment process. Although all the data in the EPILEPSIAE database is pseudonymized and doesn't contain any personal information about the patients we cannot directly integrate the database server as a normal grid member node for reasons of personal data safety. So, in the current setup, the database server is directly integrated into the grid infrastucture but doesn't have the grid middleware installed and has special restrictions for data access. On the other side, the grid node actually performing the calculations for the prediction algorithms are restricted to nodes located in the computing center of Freiburg, which are allowed to directly access the database server.